Last night, when I should have been sleeping, I came along on what promised to be a tiki rampage across the cocktail bars of the city. It turned out to be a bit more sedate than I’d feared/hoped - the Cosmopolis crawl for cosmopolitans restricted itself to the downtown core - but at least I didn’t end up stranded in some strange corner of the city, nursing a frou-frou drink in a dive bar. Also, I didn’t smoke any of the cigars pictured above. I was just holding them for a friend. Literally. 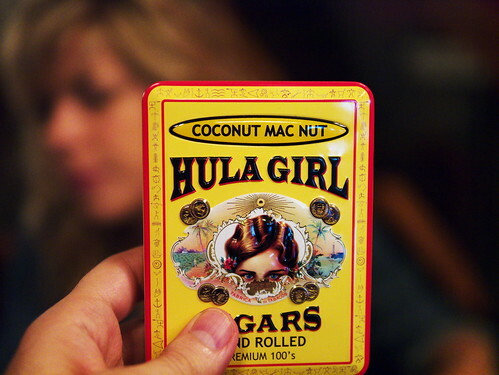 That’s my hand holding up the Hula Girl box. My friend and editor Steve wanted a nice picture of his little sticks of death. I caught Kat in the background. But why, Aidan? Why did you go out drinking on a weeknight, whyyyyy? Shut up, whiny sentence. A little fascis of prairie dog writers trooped out to drink cocktails and record the results in real time. * The increasingly unhinged maunderings of drunken alt-weekly journalists (or when I’m there, “journalists”) will be coming out in prairie dog’s Drink issue. This should be fun. I riffed a bunch. Some of it funny. A tiny dribble of it coherent. All of it set down on a roaring hot laptop. *I love the phrase “in real time.” Beware of substitutes! Only reality offers authentic real time. Throw some real time in the deep freeze - it keeps forever! Use only as directed. Apply liberally to affected areas. Test out a small amount of real time on an inconspicuous part of your life before use. Lay flat to dry (DON’T put real time in the dryer). Remember: real time gets results - in real time.